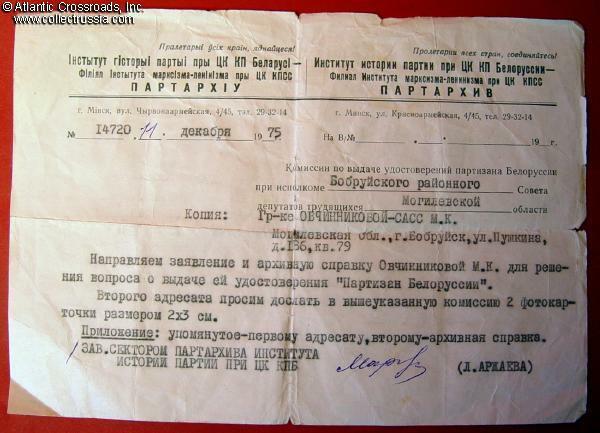 Group of 2 documents to a former dispatch runner in a Belorussian partisan unit, issued to Maiya Ovchinnikova (Sass). 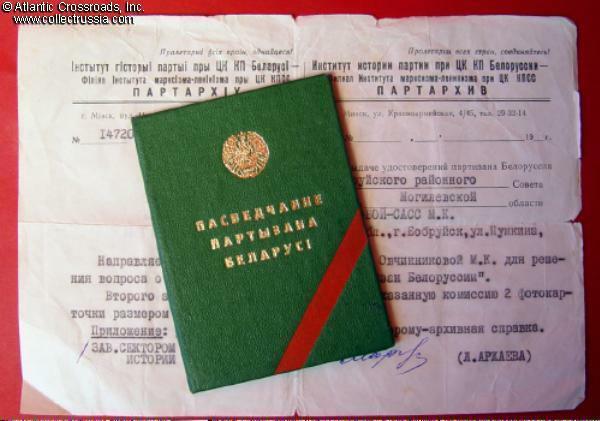 Includes Ovchinnikova's photo ID of a former partisan and a note from the Communist Party archives certifying her eligibility to receive the partisan's ID. Both documents are in excellent condition. The hard-bound Photo ID of a Former Partisan in Belorussia shows that during April 1943 through July 1944 Ovchinnikova was a dispatch runner in the partisan detachment "For Soviet Belorussia", Groza (Thunderstorm) Partisan Brigade. The ID was filled-out in January 1979 by the Vitebsk City Council. The archival document was issued in December 1975 by the Archives of the Institute of Party History, Central Committee of the Communist Party of Belorussia. It says that an official statement (apparently confirming Ovchinnikova's claim) and archival excerpts are being sent to the Executive Committee of Bobruyisk District where she lived at the time. The note also requests that Ovchinnikova send two 2x3 cm photos - obviously to use for her Partisan's ID. 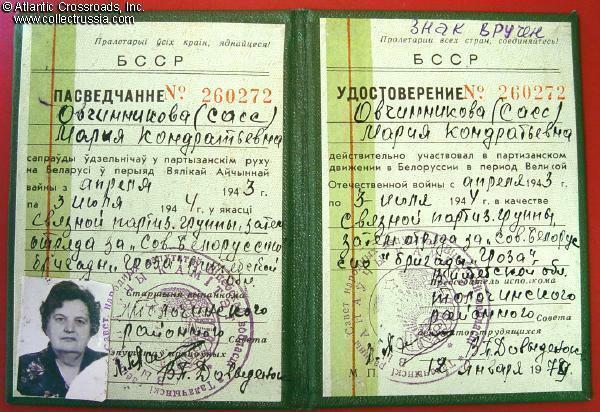 Interestingly, after the note was sent it took another 4 years for the Soviet bureaucracy to actually issue the ID card.